As a blogger, I should know better and split my posts up to create more content, but I’m getting so deep into my book launch, you’re getting two posts in one! Whew, that was a long break! I was planning on taking some time out and getting some distance from all the work of writing, marketing and blogging. Instead, I spent the holidays worrying about all the writing, marketing and blogging I could have been doing. So here comes a long overdue, two-in-one 2017/2018 New Year’s look back and look forward post. First of all, I got this whole blog up and running! It’s so much better than the old website and it took a while to find my style, but now I’m really enjoying it. Plus, double-digit followers, woohoo! 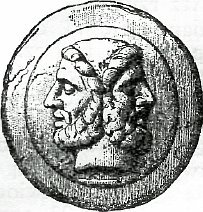 It’s Janus! Patron god of blog wrap-up posts. I passed some key bookblogger milestones: I did my first guest post and hosted my first one as well. I also participated in my first book tag. As an author, I also passed some big milestones: I published my first short story and my first novel, I did my first author interview, and now apparently, I’m due a few (emphasis on few) bucks from my very first royalty payment! The Justice League Movie Book Tag – My most graphically intensive post, and I got to connect with a lot of cool bloggers! Soviet Propaganda Art in Wartime – Probably my favourite post to do. I just love artwork from that era. Review: Nanjing: The Burning City – Grim subject matter, but the combination of bookish and historical content is exactly the type of thing I want to do with my book reviews. Here’s the bad news for the blog. I’m fully absorbed by the publicity work for Sparrow Squadron. This means a disruption to my regular blogging activities for the next three months or so. Expect a reduction in bookish posts, and drop in the frequency of posts as well. The good news, though, is that I’ll still be putting out a lot of blog posts on the history side, with a focus on subjects related to Sparrow Squadron: World War II, women in combat, and Soviet history. You’ll also see a shift later in the year to covering books and topics related to the sequel, Sparrow Falling. I haven’t totally abandoned regular bookblogging. Look for Super Bowl and Valentine’s themed posts in February. I’m going to be doing some fun things with my static website pages as well, such as character profiles for Sparrow Squadron. There’ll be a noticeable break in my blogging as the Sparrow Squadron blog tour comes around (March 5-16, 2018.) I’ll be linking to promo posts that participating bloggers will be putting up. I’ve been saving some special content for them, including a never-before-published excerpt from the novel. Sign up for the blog tour with YA Bound Book Tours here! I’m really happy to be getting back into the swing of things and I hope you’ll enjoy what I have in story for 2018. What was your favourite post from 2017? Let me know in the comments! First of all, congrats on the book launch 🙂 I hope it goes wonderfully from here! Thanks so much! I’m really excited by what your doing at your website, too, and how you’re organizing the international blogging community!